Hello Novelists, Poets, Lyricists, Playwrights and all manner of Authors. Welcome to the Word Weaver Award. With the New Year, we have decided to make a few changes to the way the Word Weaver Award Works (how's that for alliteration). The All New Award is actually still the wonderful old award designed by Ariadne, but it is now up to you...YES YOU!...to nominate and vote for the recipient. The writing that is voted the winner will then become the 'Featured Writing' for the month. It will be highlighted in this thread and the Author will be provided with an award, which can be placed in the person's signature should they so wish it. The Author's name and piece may be published in the Moonwatcher, Ober.Net's monthly newsletter, in the Featured Writing section. We look forward to presenting work from our fabulous writers here on Obernewtyn.Net. To nominate a writer or piece of writing for the Word Weaver Award, please PM one of your lovely Mods ~Deb or DargaFleas~ with a link to the nominated item. Be advised that there will be months where no nominations are received. If this is the case, the award will go un-awarded (or maybe the Mods will choose one). The recipient of the first All New Word Weaver Award is Dakosha for her story snippet which can be found here. Great work Dakosha. Remember to nominate any writer or piece of work by PMing Deb or Darga. Congratulations, Dakosha. A quick note that Dakosha's prize winning snippet is in Prodders, so only those with access to that board will be able to read it :). Wow, i need to check this thread more often... thanks guys!!!!!! It's nice to know ppl like my story, makes me want to keep writing it. so thank you!! 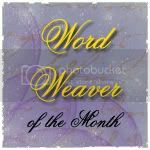 February's Word Weaver is Loren. Loren's work over the past few months has impressed the Mods with its imagery and depth of feeling. She was nominated for the WWA by Dakosha. Congrats Loren and keep posting. Congrats Loren! I have heard really good things about your stuff, even if it is the kind of thing I can't read. Keep up the good work. Congratulations, Loren. Well deserved; and see - people do listen and do care. is presented to Arwen for this post. Well done, Arwen! This was such a beautiful snippet. A note to everyone that Arwen's snippet lives in Prodders, so if you aren't a member of that forum, the above link won't take you anywhere useful :).